In February, TESPA filed a Motion for Summary Disposition arguing that BSEACD erred in granting Needmore a temporary and regular permit for 289,000,000 gallons of groundwater a year because Needmore was not eligible to apply for a temporary permit. HB 3405 states: "a person operating a well at the time of the effective date of this Act..." shall file an administratively complete permit. District rule 3-1.55.1(A)(1) states "Eligibility criteria: Persons who meet the following criteria and who submit an administratively complete permit application...may be issued a Temporary Production Permit...The person is operating an existing nonexempt well on or before June 19, 2015." TESPA argued that BSEACD determined that Needmore's well was "abandoned" under State law and that therefore, Needmore could not have been operating the well at the time the Act became effective. You can read TESPA's arguments here. TESPA stressed that the intent of House Bill 3405 was to create a streamlined process for BSEACD to permit existing, non exempt wells - it was not to create a loophole to allow one landowner to take advantage of the less stringent permitting process and apply for a massive groundwater permit. Both BSEACD and Needmore argued that TESPA was prohibited from making any arguments related to Needmore's eligibility because House Bill 3405 prohibited hearings on temporary permits. TESPA counter argued that eligibility was also a consideration BSEACD staff made when they recommended that the Board convert the temporary permit to a regular permit, and therefore, TESPA should be able to challenge Needmore's eligibility at the regular permit stage. The ALJ dismissed TESPA's arguments and ruled in favor of Needmore and the District, who on this particular issue were aligned. The aquifer test conducted by Needmore's hydrogeologist, Wet Rock Groundwater Services (the same hydrogeologist that works for Electro Purification) resulted in fourteen feet of drawdown from a monitoring well 1.95 miles from the well on Needmore Ranch. 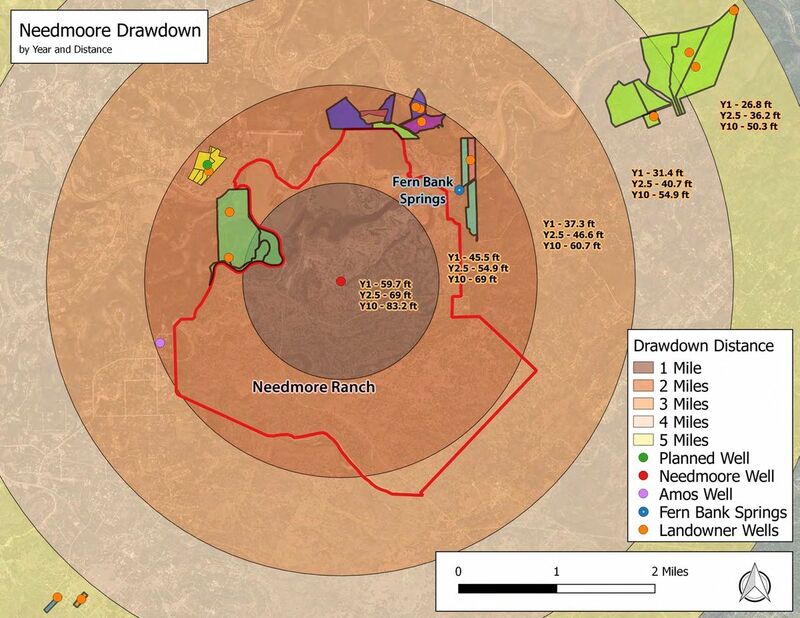 BSEACD's own modeling predicts that within seven years, pumping from the well on Needmore Ranch will cause 140 feet of drawdown in the Middle Trinity Aquifer as far as two miles from Well D. As with Electro Purification, BSEACD determined that pumping at this rate will cause unreasonable impacts to existing wells. Yet, rather than reducing or denying the permit, BSEACD staff recommended that the Board of Directors issue the permit for the full amount with special conditions designed to avoid impacts. TESPA's hydrogeologist has confirmed that the drawdown from Needmore's future pumping and Electro Purification's pumping will intersect, possibly exacerbating impacts to wells and surface water resources. TESPA is currently considering its legal options moving forward. The result of the ALJ's decision is that the BSEACD Board of Directors will now have to vote on Needmore's groundwater permit application at a final hearing. As soon as we know this date, we will post it. You can read Needmore's application and BSEACD staff's recommendation to issue the 289,000,000 permit with special conditions here. If the Board of Directors votes to approve the permit, TESPA does have the option to appeal this decision in District Court, but this is something that we will need to evaluate and consider down the road. TESPA has been fighting Needmore's water grab since the District first issued Needmore a temporary permit in 2015. 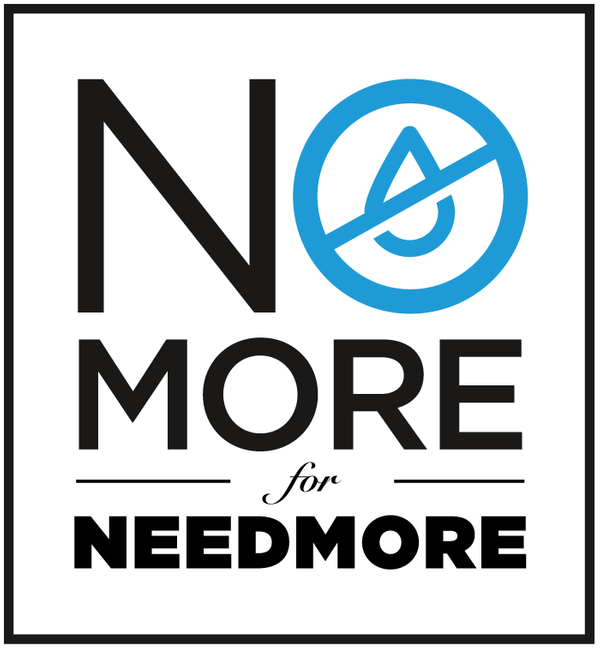 We filed comments in response to the District's decision to issue the permit and then requested a contested a case hearing in December 2016 when the District staff recommended that the Board of Directors approve Needmore's application. And we successfully fought Needmore's multiple efforts during the 2017 Legislative session to erode BSEACD's ability to regulate groundwater production on the ranch. We are extremely disappointed in the ALJ's Order, but the timing of this ruling means that the BSEACD Board of Directors will be faced with the final decision of whether to grant Needmore's permit in the midst of the concerns landowners are voicing against the District's decision to issue Electro Purification a permit. Every landowner in the area needs to attend this hearing and urge the BSEACD Board of Directors to deny or substantially modify Needmore's permit request. Unfortunately, groundwater regulations in Texas are not adequately protecting the rights of smaller landowners and the groundwater resources upon which we all depend. Current groundwater law facilitates the exploitation of groundwater resources at the expense of local, rural landowners, and as we see in the case of Needmore, the laws are designed to make challenging them extremely difficult. The Trinity Aquifer is declining, yet large-scale groundwater production permits are still moving forward. TESPA is committed to continue fight to protect our groundwater resources despite this legal set back. We will disseminate information about the process and how you can get involved as we learn more. For background information, please see the Needmore tab on our site.